The 2018 WNBA Finals will be a contest of Washington, DC vs. Washington state. 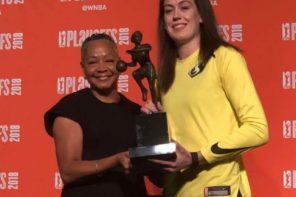 The Washington Mystics managed to make this year’s WNBA Finals for the first time in their franchise’s history. It was a season that began with a hint of uncertainty for Washington as they knew they would have to play this season with Emma Meeseman, who was such a factor in their playoff run last season. Mike Thibault’s Mystics still knew they had their nucleus of Elena Delle Donne and Kristi Toliver, and as long as they had that inside-outside threat, the Mystics can beat any team on any court. Washington, DC sports are going through a boom period. The NHL’s Capitals, which are also under the same Monumental Sports umbrella as the Mystics, won the Stanley Cup earlier in the year after defeating the Vegas Golden Knights, who made the NHL’s championship round in their first season as a franchise. Ironically, there were likely memories of that early June watch party at Capital One Arena prior to Game 5 of the hockey series – which occurred after a Mystics/Lynx game. As for the Seattle Storm, this will be their third Finals they have participated in. The previous two came in 2004 and 2010 – they won championships both seasons. The season series has been a case of have home court, will win. The Storm and Mystics have played each other on three separate occasions with the home team proving to be victorious in all three. Granted – Seattle’s two victories at KeyArena were both closer than the one the Mystics mustered at home. 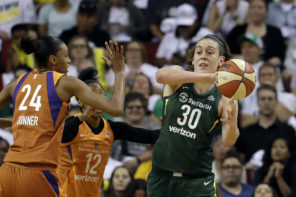 This will be the first Finals in the professional career of Breanna Stewart. A stellar outing from her and a Storm championship could mean she could follow up Sylvia Fowles last season by adding a Finals MVP along with claiming the regular season MVP. When these two teams first did battle early in the season at the Key, Seattle reeled off an 81-77 victory over Washington. More than half of the Storm’s 81 came from two players in Jewell Loyd who had 27, and Stewart who finished with 25. Natasha Howard, who was named the W’s Most Improved Player of the Year, finished with 14. Kristi Toliver had 20 points to lead Washington and Aerial Atkins added 18 to the Mystics’ efforts. Tianna Hawkins had 17 and Myisha Hines-Allen contributed 10 points along with 11 rebounds. Both teams had issues taking care of the basketball as a combined 30 turnovers were committed between the two teams. The Mystics were without Elena Delle Donne for this game. The Mystics did have Delle Donne for their second contest against the Storm, but the result was still the same as it was in their first get-together. This time, Seattle won by a final of 97-91 at home. Stewart, as usual led with 25 points and 10 rebounds and Sue Bird finished with 21 points. Alysha Clark tallied 11. Aiding the Storm’s efforts off the bench was Crystal Langhorne and her 12 points as well as Kaleena Mosqueda-Lewis who scored 10 of her own. Seattle’s bench outscored Washington’s 22-7. They won despite 29 from Delle Donne and another 18 via Toliver. Atkins added 17 and LaToya Sanders and Natasha Cloud finished with 10 each. 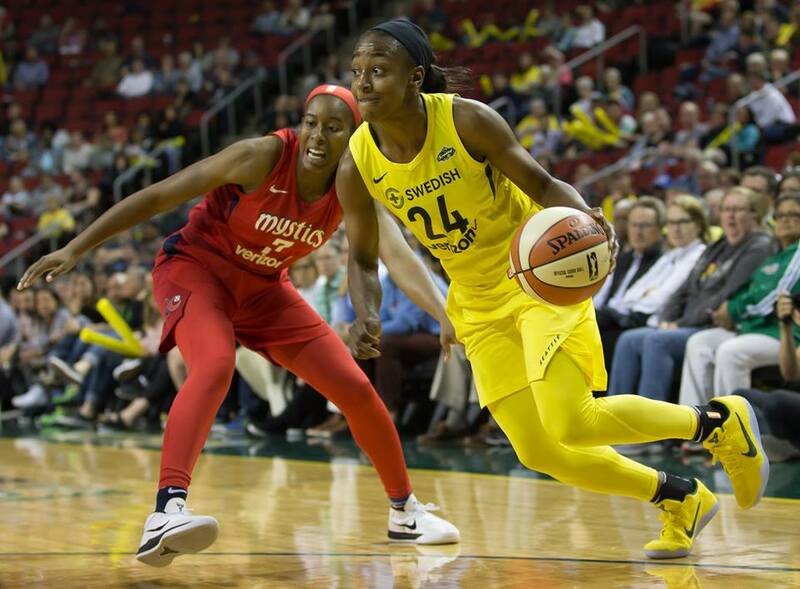 The most recent meet-up between the Storm and Mystics happened in the Nation’s Capital – and it would be a polar opposite of the way the first two contests turned out. This time, Washington reached the century mark and blew out Seattle by a final of 100-77. When a team scores 100 points in a single game that is not the All-Star Game, one has to go immediately to the field goal percentage. The Mystics shot a robust 58 percent from the field. They even shot 46 percent from behind the arc – and only one of those triples came from Toliver. Delle Donne finished with 30 points. Sanders contributed 17, Cloud scored 14, and Atkins tallied 12. For Seattle on this game, both Howard and Loyd each scored 15 points. Stewart had 10, but she only shot two out of five from the field along with making all six of her free throw attempts.